The perennial tradition of winning in Cleveland is back for the Ravens! To be fair to Cleveland, this is not the same Browns as years past, and the Ravens cannot afford to underestimate them. The Browns may make this game more difficult for the Ravens this year than it has been in years past. However, a win is still likely in the cards for Baltimore. The Ravens are simply more experienced, have had more success, and make fewer mistakes than the Cleveland Browns. A victory for Baltimore must come through the Ravens outperforming in three key areas of the game. The Ravens are likely to beat out the Browns in all three departments. Baker Mayfield is perhaps Cleveland’s messiah, born into the world to end the eternal quarterback carousel. While his talent is undeniable, his development into a franchise quarterback will take time. Cleveland will see Mayfield make mistakes. Against the Ravens, Mayfield is bound to make many, ugly mistakes. In the two games Mayfield played in so far, he faced the mediocre Jets defense, and the 27th ranked Raiders defense. The Ravens are the NFL’s second-ranked defense. Mayfield is bound to panic once the confusing blitzes drawn up by Don “Wink” Martindale attack him. He will have a difficult time passing into the most elite secondary in the league, led by returning cornerback Jimmy Smith, Marlon Humphrey, Brandon Carr, and Tavon Young. For Mayfield to remain calm and play well, would be nothing short of a miracle. The great storyline in Baltimore is the emergence of a strong offensive attack. Led by Joe Flacco, the offense has reinvigorated a fan base tired of watching a lackluster product on the field. John Brown and the receiving corps have dazzled, giving Joe Flacco a set of powerful weapons for the first time since 2014. The offense is confident and eager to improve upon an already stellar start to the season. The Cleveland Browns’ defense, above average on paper, allows 395 yards per game. The Browns’ defense will be hardpressed to stop Baltimore’s offensive machine. As long as Flacco can get the ball downfield, and into the end zone, the Ravens should be able to pull away with a victory. If Alex Collins can achieve a break out performance on Sunday as well, the Ravens will be able to run away with the victory. The running game is the one area that the Cleveland Browns exceed in. The Browns, led by Carlos Hyde and Nick Chubb, average 152.8 yards per game on the ground. The Ravens, however, are one of the best defenses against the rush, holding opponents to an average of just 82.5 rushing yards per game. This key battle could go either way, but the Ravens get the advantage, as the defense is more experienced. The Ravens defense ties together well and the dominance of it cannot be ignored. The Browns will grab yards on the ground, however, not nearly as many as usual. 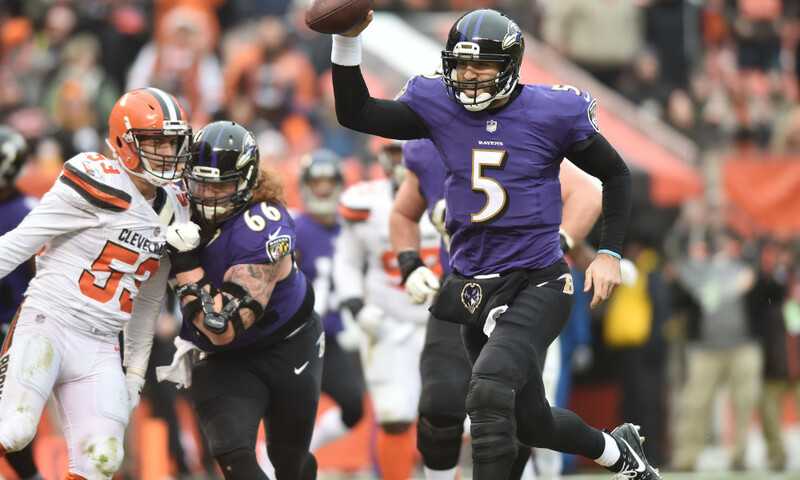 The Baltimore Ravens offense will continue to find success, this time dropping four touchdowns on the Cleveland Browns. Baker Mayfield will be visibly rattled, throwing for a touchdown, but also two interceptions, and no more than 150 passing yards. The Ravens will have an upper hand when it comes to keeping the Browns rushing attack down. The Browns will find about 90 yards on the ground, however. The game will end in a 17 point victory for the Baltimore Ravens. The final score will be 34-17, and the Baltimore Ravens will jump to 4-1. Well, I guess miricles do happen… Mayfield was NEVER rattled. The Browns are the ones who can no longer be ignored and counted on as automatic wins. The Browns are back, thanks to our rookie duo sensation Mayfield and Ward. Previous Previous post: Will This Be the Game that Alex Collins Breaks Out?